Dean Preston Smith (right) runs in the Queen City Marathon in Regina. It won’t come as a surprise to many in the College of Medicine that Dean Preston Smith is a runner. 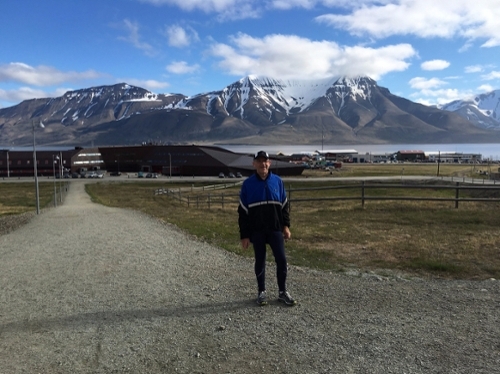 In fact, it’s a pastime he’s been happy to share with the wider CoM community, include tweeting photos from some of his more spectacular runs including rural Norway. 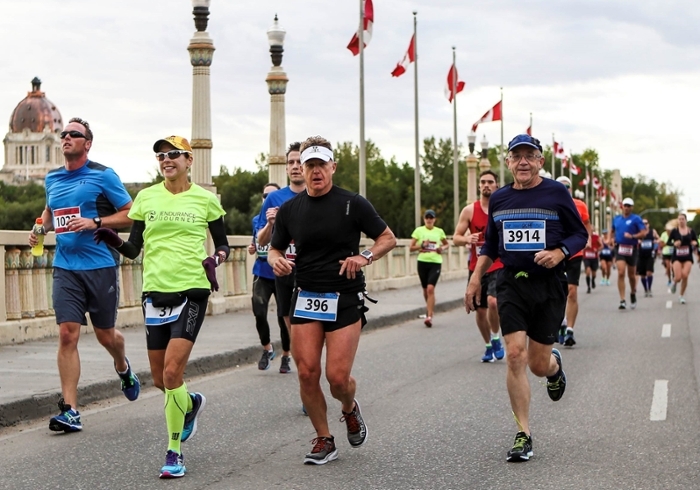 And last weekend Dr. Smith took part in the Queen City Marathon in Regina, finishing the 42.2km in 03:35:45.0. The time is good enough to put him under the qualifying time for the Boston Marathon, which Smith calls ‘the holy grail for recreational runners,’ and if he does it will be the fourth time he has qualified, having previously run the marathon in both 2004 and 2005. The pair will also be running in the Dublin Marathon on October 30, and while they won’t be running with a time goal in mind, Smith admits that he wanted to push himself in Regina because he couldn’t resist the temptation to see if he could make the Boston Marathon time again. “It was a really well-run event, and a good event to qualify for Boston,” Smith continued. “The Boston Marathon qualifying time for my age group is 3:40:00, so I ran a qualifying time, but it’s more complicated than that — the marathon caps at 30,000 runners, and more people often run the qualifying times than they can handle. Smith ran more than four minutes under the qualifying time, which he hopes will be enough to earn him a berth in the 2017 marathon next April. “The application process unfolds over the next two to three weeks, so I won't know until then,” he explained. “But if I get in, I’ll be going. Article re-posted on Jan 18, 2019 4:20:53 PM .